The honors were shared in the much awaited Kolkata Derby when the two Kolkata giants - East Bengal and Mohun Bagan clashed in Siliguri's Kanchenjunga Stadium. The game, which was very well officiated by the on field referees, failed to find any goals though it never lacked intensity. 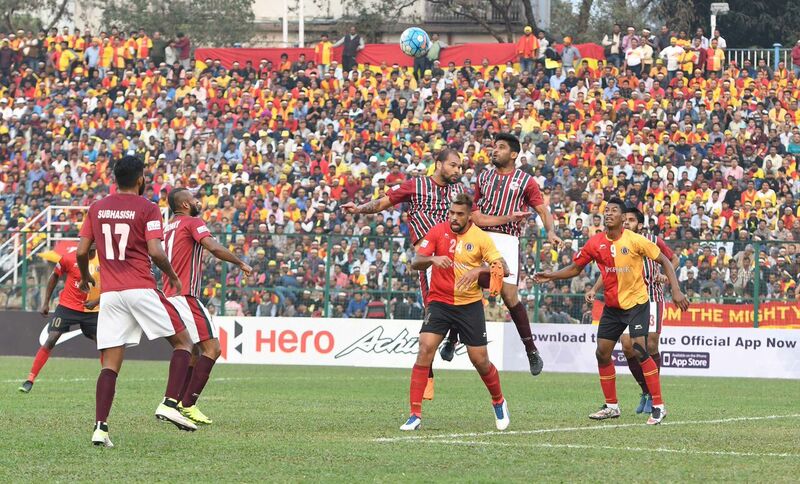 Cheered by a venomous crowd, both East Bengal and Mohun Bagan had their chances to get the breakthrough but both the goalkeepers - TP Rehenesh(East Bengal) and Debjit Mazumder(Mohun Bagan) made some important saves and thus securing their respective clean sheets. Mohun Bagan's best chance came in the 35th minute as Sony Norde's dipping corner was palmed by Rehenesh but Eduardo Ferreira failed to make contact from his attempted volley. East Bengal's best bet came from Willis Plaza as his sudden burst of pace caught Eduardo asleep before his shot was expertly saved by an alert Debjit. The scoreline remained 0-0 in the season's first derby. 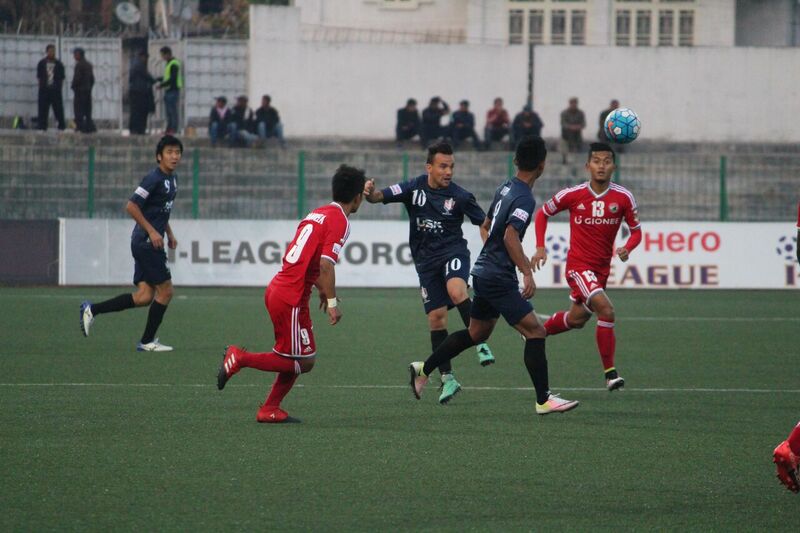 Aizawl FC defeated Churchill Brothers FC 3-1 at the Rajiv Gandhi Stadium. 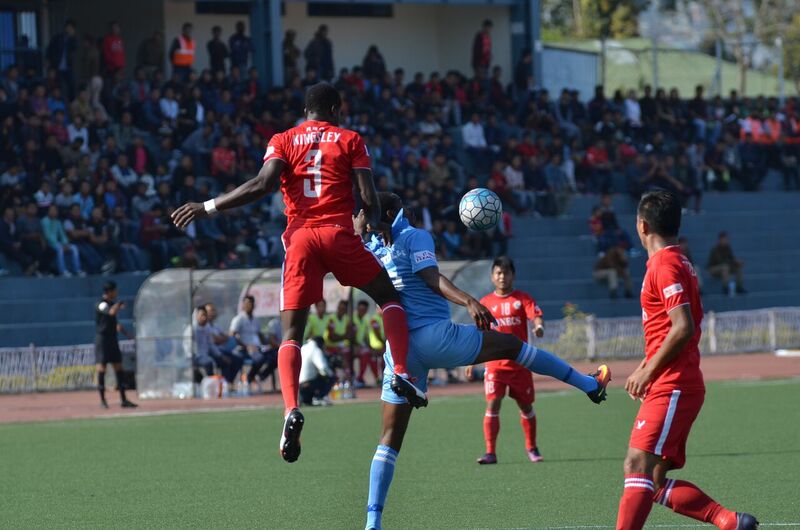 Lalramchullova (62nd), Kamo (69th) scored for Aizawl after Ansumana Kromah(33rd) had given Churchill Brothers the lead. An own goal from Nongkhlaw (77th) put all doubts to rest as Khalid Jamil's men secured all three points. A foul on Anthony Wolfe was adjudged illegal as the referee pointed to the spot on the 32nd minute. The resulting penalty was converted smartly by Ansumana Kromah to hand Churchill Brothers the lead. The home side equalized in the 62nd minute and it was again from the spot kick from which Lalramchullova converted. Seven minutes later the home side rejoiced as Kamo Bayi finished off expertly after being fed by Jayesh Rane. And if it was not all, an unfortunate own goal from Banpynkhrawnam Nongkhlaw's in the 76th minute sealed the fate of the match for Aizawl FC. Shillong Lajong FC were finally defeated at home in this season's Hero I-League after DSK Shivajians FC became the first team to come out with any points from Shillong. In a match where all the goals came in the first half, strikes from Sanju Pradhan(16th) and Shane McFaul(44th) decided the outcome of the match. Sanju Pradhan struck early for the visitors in the 16th minute, after Sanju Pradhan's intended lobbed pass was handed straight back to the winger's path by Samuel Shadap who smashed the ball home. Hero I-League 2017's top scorer Dipanda Dicka got the equalizer for Shillong Lajong FC in the 33rd minute when he found himself unmarked from a corner kick to slot the ball home from close range. Shane McFaul sent the home crowd to silence in the 44th minute when Shillong Lajong FC custodian Vishal Kaith failed to palm away a Juan Quero corner and the ball fell straight to McFaul who made no mistake from point blank range. Some smart saves from Subrata Paul and the woodwork denied Shillong Lajong FC a way back into the game as the scoreline remained 2-1 after the full time whistle. 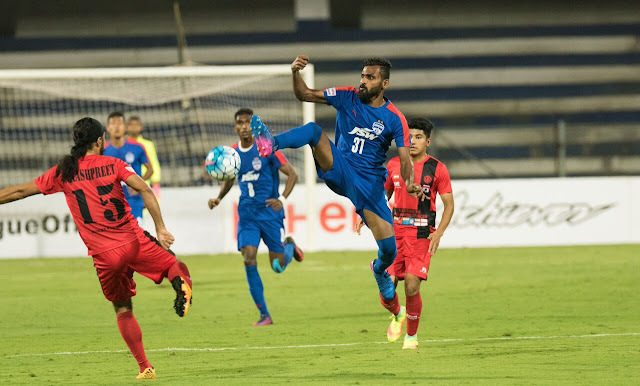 Bengaluru FC dropped point and this time not away but at their fortress - Sree Kanteerava Stadium, against Hero I-League debutants Minerva Punjab FC. Minerva Punjab FC came out of the tie with a hard fought draw while Bengaluru FC's title challenge turned slimmer. The opening goal came in the 52nd minute after Udanta's cross was not dealt properly by the Minerva defence and skipper Sunil Chhetri made the most of it slamming the ball home from a half volley. Minerva Punjab FC became the first team to get any points from Bengaluru FC's fortress as a harmless Germanpreet Singh's cross was turned goalwards by the Blues defender Sandesh Jhingan who was handed a start in this match due to suspension of first choice centre backs. 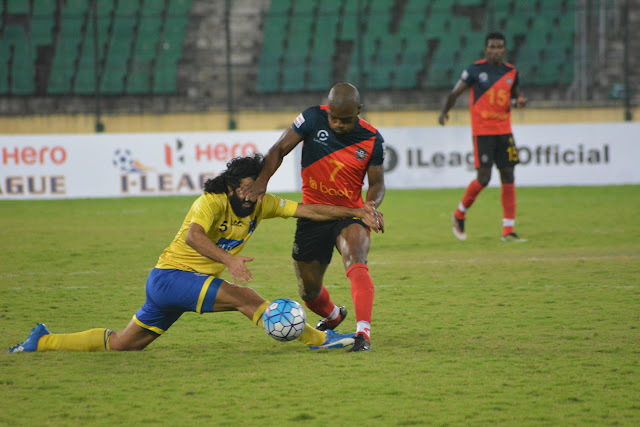 Chennai City FC got the better of a struggling Mumbai FC side at the Jawaharlal Nehru Stadium, Chennai on Saturday in the Hero I-League 2016-17 clash. Mumbai FC's new signing Anderson da Silva scored on his debut from the penalty spot, slotting the ball home with literally his first touch in the 28th minute. Chennai City FC responded immediately as the action shifted to the other end. Edwin Vanspaul's corner kick was brilliantly headed by Dhanapal Ganesh as the ball nestled the top left corner leaving the goalkeeper with no chance. Individual brilliance from Charles de Souza settled the match as a pass from the right saw the Brazilian flicking the ball over one defender and beating another one along with the goalkeeper with his next touch before tapping the ball into an empty net.